Home » Fitness Gear and Clothing » What Type of Training do you need to be Healthy? What Type of Training do you need to be Healthy? 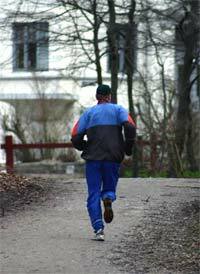 In essence, there are two types of training, aerobic and anaerobic. To be healthy and feel good in your shoes you need to incorporate a little bit of both. Basically the most common form of anaerobic training is weight training done in the gym or at your home. In spite of what many people think you don’t need to lift huge weights to achieve something significant in this field. Actually you only need a moderate workout to keep your blood flowing and stimulate your muscles to grow and preferably burn fat. Aerobic training or as it is more usually called, cardio training involves longer period of exercise but with a lot less intensity than weight training. People are commonly more prone to cardio training, for example, running outside or on a treadmill, riding a typical bike or a stationary bike or even using some advanced pieces of equipment like elliptical trainers. However, many people are not so determined and give up on training pretty easily. Whatever you choose to go with you got to keep it interesting or you will lose interest very soon. Watching TV while running on a treadmill or listening to music via your headphones for running will motivate you always during those long minutes of exercising. If you are an outdoor type runner you can buy a GPS running watch to keep track of your performance parameters. In the end it’s not wise to stick just with one type of activity, because our bodies require diverse stimulation. For example, although running can lower your heartbeat and increase your lung capacity, it may pose a threat to your ankle and knee joints, which might be a problem if you’re an older person or someone recuperating from an injury. In that case it would be wise to lessen the running and include some anaerobic activity like weight training.